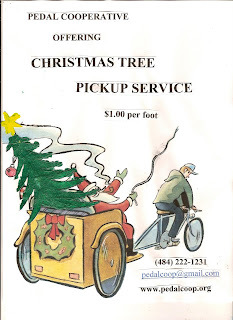 The Pedal Cooperative, Philadelphia-based bicycle haulers, are offering Christmas tree removal. The fee is $1.00 per foot, so a 5 ft. tree would have a $5.00 charge. It’s truly a great and green way to dispose your Christmas tree. The trees collected by Pedal Co-Op will be used for composting. Sign up today by contacting Woody at pedalcoop@gmail.com. In the city of Philadelphia, Christmas trees left on your curb will be collected with rubbish and sent to a landfill. If you wish to recycle or compost your tree, it will have to be delivered to the Streets Department Sanitation Convenience Center. For more information, click here. For more information on the Pedal Cooperative and their services, please visit their website at pedalcoop.org or by calling (484) 222-1231.